Nibiru 2012, a supposed planet discovered by the Sumerians, is headed toward Earth. Zecharia Sitchin, who writes fiction about the ancient Mesopotamian civilization of Sumer, claimed in several books (e.g., The Twelfth Planet, published in 1976) that he has found and translated Sumerian documents that identify the planet Nibiru, orbiting the Sun every 3600 years. 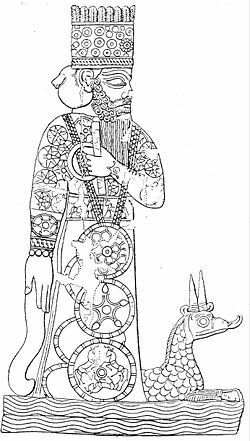 These Sumerian fables include stories of “ancient astronauts” visiting Earth from a civilization of aliens called the Anunnaki. infrared sources, but none of them was Nibiru 2012 or Planet X or any other objects in the outer solar system. “Planet X” is an oxymoron when applied to a real object. The term has been used by astronomers over the past century for a possible or suspected object. Once the object is found, it is given a real name, as was done with Pluto and Eris, both of which were at some time referred to as Planet X. If a new object turns out to be not real, or not a planet, then you won’t hear about it again. If it is real, it is not called Planet X. Eris is one of several dwarf planets recently found by astronomers in the outer solar system, all of them on normal orbits that will never bring them near Earth. Like Pluto, Eris is smaller than our Moon. It is very far away, and its orbit never brings it closer than about 4 billion miles. There is no secret about Eris and its orbit. There is a telescope at the South Pole, but it was not built by NASA and not used to study Nibiru 2012. 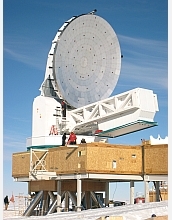 The South Pole Telescope was supported by the National Science Foundation, and it is a radio telescope, not an optical instrument. It cannot take images or photos. The great majority of the photos and videos on the Internet are of some feature near the Sun (apparently supporting the claim that Nibiru 2012 has been hiding behind the Sun for the past several years.) These are actually false images of the Sun caused by internal reflections in the lens, often called lens flare. You can identify them easily by the fact that they appear diametrically opposite the real solar image, as if reflected across the center of the image. This is especially obvious in videos, where as the camera moves, the false image dances about always exactly opposite the real image. Similar lens flare is a source of many UFO photos taken at night with strong light sources such as streetlights in the frame. One widely reported telescopic photo as shown on the right side, two views of an expanding gas cloud far beyond the solar system, which is not moving; you can see this from the fact that the stars are the same in both pictures. 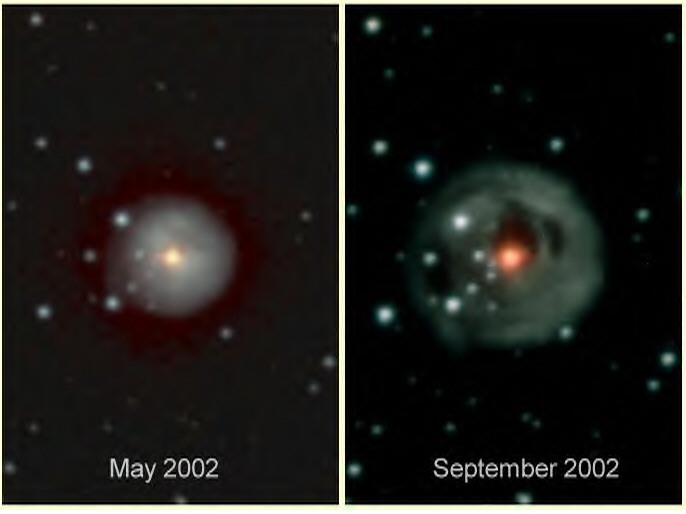 A sharp-eyed reader of this website identified these photos as a gas shell around the star V838 Mon. Blank rectangle in Orion in Google Sky, which is a presentation of images from the Sloan Digital Survey. This can’t be a “hiding place” for Nibiru 2012, since it is a part of the sky that could be seen from almost everywhere on the Earth in the winter of 2007-08 when much of the talk about Nibiru began. That would contradict the claims that Nibiru was hiding behind the Sun or that it could be seen only from the southern hemisphere. Calendars exist for keeping track of the passage of time, not for predicting the future. The Mayan astronomers were clever, and they developed a very complex Mayan calendar. Ancient calendars are interesting to historians, but of they cannot match the ability we have today to keep track of time, or the precision of the calendars currently in use. The main point, however, is that calendars, whether contemporary or ancient, cannot predict the future of our planet or warn of things to happen on a specific date such as 2012. As per polar shift theory, a reversal in the rotation of Earth is impossible. It has never happened and never will. There are slow movements of the continents (for example Antarctica was near the equator hundreds of millions of years ago), but that is irrelevant to claims of reversal of the rotational poles. However, many of the disaster websites pull a bait-and-shift to fool people. They claim a relationship between the rotation and the magnetic polarity of Earth, which does change irregularly with a magnetic reversal taking place every 400,000 years on average. As far as we know, such a magnetic reversal doesn’t cause any harm to life on Earth. And there is no planet alignment in 2012 or any other time in the next several decades. As to the Earth being in the center of the Milky Way, I don’t know what this phrase means. If you are referring to the Milky Way Galaxy, we are rather far toward the edge of this spiral galaxy, some 30,000 light years from the center. We circle the galactic center in a period of 225-250 million years, always keeping approximately the same distance. The “dark rift” is a popular name for the broad and diffuse dust clouds in the inner arm of the Milky Way Galaxy, which block our view of the galactic center. The entire “galactic alignment” scare is pretty funny. Near solar maximum (which happens every 11 years approximately), there are many more solar flares and coronal mass ejections than near solar minimum. Flares and mass ejections are no danger for humans or other life on Earth. They could endanger astronauts in deep space or on the Moon, and this is something that NASA must learn to deal with, but it is not a problem for you or me. Fox News website reports that in 2012 a “Powerful Solar Storm Could Shut Down U.S. for Months” which explains a worst-case analysis of what could happen today if there were a repetition of the biggest solar storm ever recorded (in 1859). The problem is the way such information can be used out of context. There is no reason to expect such a large solar storm in the near future, certainly not in 2012 specifically. The Earth has always been subject to impacts by comets and asteroids, although big hits are very rare. The last big impact was 65 million years ago, and that led to the extinction of the dinosaurs. Today NASA astronomers are carrying out a survey called the Spaceguard Survey to find any large near-Earth asteroids long before they hit. We have already determined that there are no threatening asteroids as large as the one that killed the dinosaurs. All these data proves that Nibiru 2012 doomsdays is a complete hoax. But scientists, both within NASA and outside, recognize that this hoax with its effort to frighten people is a distraction from more important science concerns, such as global warming and loss of biological diversity. We live in a country where there is freedom of speech, and that includes freedom to lie. You should be glad there are no censors. But if you will just use common sense I am sure you can recognize the lies. As we approach 2012, the lies will be come even more obvious about Nibiru 2012.